The first complete translation of the Siri Guru Grant’h Sahib into English was provided by Dr. Gopal Singh; this was completed around 1960. It was published in a four-volume set, and has received wide distribution. The ‘International Edition’ was published by the World Sikh University Press in 1978. Dr. Gopal Singh's stellar reputation for scholarly work in service of the Dharma is well deserved. In fact, the introduction to the work, in the first of the four volumes, is a remarkable work in and of itself. Especially readable and worthwhile is Section II: On the Philosophy of Sikh Religion. In this treatise on comparative religion, he traces the common threads of religious thought throughout the ages, giving one a deeper appreciation of Sikh Dharma. His brief explanation of the Kundalini and Yogic traditions is well done. His grammar, however, is somewhat antiquated and distracting. He included excellent footnotes explaining legendary persons, Hindu mythology and local folk idioms, and these often reveal more clearly the true meaning of the Guru’s Word. Often, he explains the linguistic derivation of a word or idiom. From his thorough understanding of comparative religion, he brings to light the common threads which run through Sikhism and other religions. Page breaks, however, are only roughly approximated to the original; the numbering system of the original is roughly preserved, although there are a large number of mistakes in the numbers. A very different translation was published just a short time after Dr. Gopal Singh’s work came out. Back in 1948, after Sardar Man Mohan Singh, a devout Sikh, lost everything worldly in the partition of India and Pakistan, he began work on what would be a lasting legacy. He worked on this for 12 years, completing it in 1960. This is the ‘eight-volume set’ with the original Gurmukhi, side-by-side with translations into English and Panjabi, with nearly every word individually cross-referenced across the three languages. The S.G.P.C. published and distributed this eight-volume set in a dark blue cover, starting with the first volume in 1962, and completing the eighth in 1969, the year in which Man Mohan Singh passed on. For the first time, Sikhs all around the world had access to a most practical resource in understanding the Word of the Guru. It has become common practice in all parts of the world to install this eight-volume set as Guru, and read out the Hukam in both Gurmukhi and English, and sometimes in Panjabi as well. Many Gurdwaras, especially larger ones, have a single volume Gurmukhi Bir installed, and use this eight-volume set to read out the translation. Page breaks appear to be precisely placed, but are actually not precisely correlated to the original, and there are many typographical errors. There are also small passages of the original which are omitted in this work - again, purely typographical mistakes. Overall, this work represents a distinctly more accurate and direct translation of the Guru’s Word, although it includes a large number of antiquated, idiosyncratic expressions more common to 18th and 19th century British India - words like mammon (for Maya), myrmidon, collyrium, mumpers, gnosis (for knowledge), apostates, sans (French for without), etc. Much of his grammar is so dated as to be distracting, and even confusing to the modern ear. In spite of these difficulties, the translation has a much deeper impact, and a more obvious accuracy, than the Bhai Gopal Singh translation. It is very poetic, and conveys a sense of humility and devotion. According to his own introduction to the book, Gurbachan Singh Talib of Panjabi University, Patiala, was assigned in 1977 the task of compiling a new translation of the Siri Guru Grant’h Sahib. It is grammatically the least satisfying - that is, the most distracting - of the three works so far. He does include many useful footnotes, shedding some light on the Guru’s Teachings. Overall, however, it adds little to the Man Mohan Singh translation, and it has not superseded either of the previous translations. More recently, in 1993, another work was printed and made available. Pritam Singh Chahil printed the Man Mohan Singh Edition back in Chandigarh, in the 1960’s; in 1986, he was inspired by a Gurdwara service in Berkeley, in which the ‘8-volume set’ was installed as Guru, and ‘Shabad sheets’ were passed out to the Sangat. He had a vision that the entire Guru should be printed in this three-column format, and so he set about to do it. He completed it in 1990, and in 1993, it became available. It is in a three-column format, with Gurmukhi on the left, English translation on the right, and Romanized transliteration in the center of each page. He has made a fairly close, but not quite exact, approximation of page breaks, and preserved the numbering system fairly well. This translation is only a slightly revised version of the Man Mohan Singh translation; its unique format allows the Guru’s Word to be approximated in pronunciation, even by those who do not yet read Gurmukhi. However, the transliteration system used is the old British-English notation; it is counter-intuitive to most modern readers, and leads to many mispronunciations. Also, most of the more distracting idioms and antiquated expressions of the Man Mohan Singh translation are copied verbatim. to achieve the immediacy of impact which the Guru's Word deserves in translation. Original page breaks are followed exactly, along with the numbering system at the ends of lines. By the Grace of the One Supreme Being, The Eternal, The All-pervading Purusha, The Creator, Without Fear, Without Hate, the Being Beyond Time, Non-incarnated, Self-existent, The Enlightener. With the (Pleasure-) loads of the worlds. Of a myriad cleverness, not one works. How then to be True? How rend the Veil of sham, untruth? True is His Name, creative His personality and immortal His form. He is without fear, sans enmity, unborn and self-illumined. By the Guru's grace He is obtained. 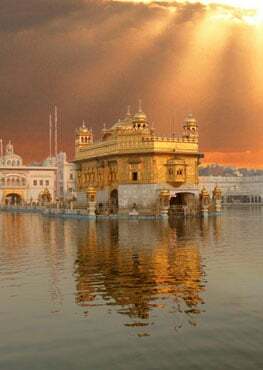 True in the prime, True in the beginning of ages, True He is even now and True He, verily, shall be, O Nanak! By pondering on God, man cannot have a conception of Him, even though he may ponder over lacs of time. Even though one be silent and remain absorbed in the Lord’s constant love, he obtains not mind’s silence. The hunger of the hungry departs not, even though they may pile up loads of the world’s valuables. Man may possess thousands and lacs of wits, but not even one (avails him in the Lord’s court) or (goes with him). How can we be true and how can the screen of untruth be rent? By obeying, O Nanak ! the pre-ordained order of the Lord of will. Self-Existent; Realized by grace of the holy Preceptor. Nor may absorption in trance still it, however long and continuous. Possessing worlds multiple quenches not the rage of avarice and desire. A thousand million feats of intellect bring not emancipation. How then to become true to the Creator? how demolish the wall of illusion? Through obedience to His Ordinance and Will. The Creator of all is One, the only One. Truth is his name. He is the doer of everything. He is without fear and without enmity. His form is immortal. He is unborn and self-illumined. He is realized by Guru’s grace. He was True in the beginning. He was True through all ages. He is True even now. Nanak says, He shall ever be True. 1. By pondering, one cannot have the conception of God even though one may think million times. Even though one be silent and remain constantly absorbed, He cannot be known by this silence. The hunger of the hungry does not appease even though one may collect loads of worldly valuables. One may have millions of skills but none goes with him in the hereafter. How can one become truthful and dispel the veil of illusion? Nanak says by obeying the pre-ordained order of the Lord and surrendering to His Will. 1. Creative Being Personified. No Fear. No Hatred. True In The Primal Beginning. In reading Bhai Gopal Singh's translation, what sticks out most are the forced restructuring and breaking up of sutras and sentence structure, and the frequently inserted parenthetical phrases. These create unavoidable distractions for the reader. Moreover, his use of words such as ‘howso’ and ‘forsooth’, words not in common usage, further detract from the impact of the rendering. Man Mohan Singh’s translation is perhaps even more obtuse to the modern reader. Antiquated expressions abound, such as apostates, myrmidons, mumpers, mammon, etc. He often uses phrases which are grammatically inconsistent, such as, ‘Even though one be silent and remains absorbed constantly he obtains not mind’s silence.’ And, similarly to Bhai Gopal Singh, he inserts parenthetical phrases of words not actually in the original Gurmukhi, which are intended to more fully elucidate the meaning of the passage. Again, the use of parentheses is usually distracting. Gurbachan Singh Talib takes much wider license with the Guru’s Word, so that the original is often not even detectable in the translation. While all others have translated ‘soch’ in the first Pauree of Jap Ji as ‘thought’ or ‘conceptualization’, he alone translates it as ‘ritual purification’. And when translating ‘Hai bhee sach, Naanak hosee bhee sach’, instead of the accepted translation of ‘sach’ as ‘Truth’, he translates these lines as, ‘Nothing is real but the Eternal. Nothing shall last but the Eternal.’ Instead of parentheses to denote words and phrases added to the translation which are not in the original, he uses italics, which is still distracting. As with the previous translations, these grammatical errors stick out to modern readers of English, and detract from the impact. Pritam Singh Chahil’s translation more closely approximates readable English in its phraseology and idioms, but his grammar, once again, falls short of the mark. Our current translation is written in contemporary English, maintaining consistent grammar. The idioms used are those in common usage, and word order reflects the original whenever possible. Repeated words in the original are faithfully repeated in the translation. For example: ‘Simaro simar simar sukh paavao’ – ‘Meditate, meditate, meditate in remembrance, and find peace.’ Page breaks are correlated with the original single-volume Bir. Of course, there will be mistakes found in this translation, as in all others. Our prayer is that, in spite of any limitations, this may be a tool to assist the Sikh, the Seeker, in the quest to find and experience Truth.